Houses look pretty now. It’s that time of the year in this region. Blooms of color, the size of trees, right in our front yards. Last year the color was a warm yellow with spots of orange and crimson. This year a full burnt orange. Same tree, different weather, water and exposure. Kind of like us. 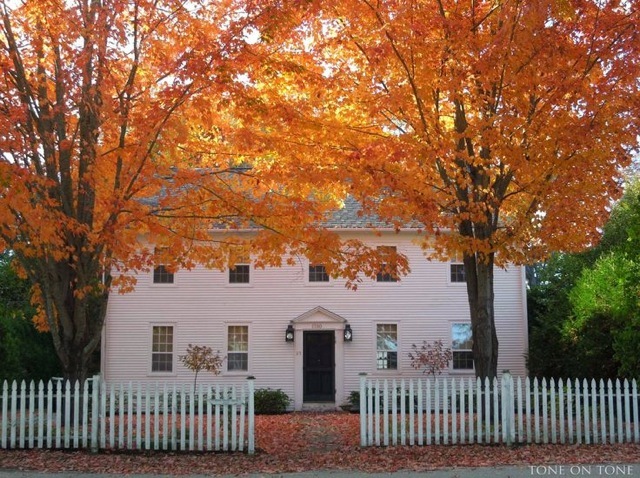 The houses we live in and the houses we view are reintroduced year after year thanks to fall. Trees are organic creatures, slipping into winter dormancy, letting the colors appear as illustration of the year preceding. And there’s the house. A little less covered than summer and not yet left standing stark in winter wind. Houses love this season. Surrounded by the fall colors and flattered by holidays, houses provide shelter, utility and security. When these things are lasting, legacy sets in. In America, almost anywhere you live, between September and February, there’s a bunch of holidays. I like this part of the year. Customers are surprisingly busy during these months. It seems homeowners think nothing of renovating a room right in the middle of it all. I’ve been lucky to stay busy through a lot of holidays working on homes. And alongside the customer I watch these houses in different seasons. Doing a bathroom in a south facing bathroom one winter, I felt the full effects of the sun passing the sky during my work days. It felt cold, even in a perfectly warm house. Summer time is the season that basements and window wells call. And now fall. The third act of spring’s renaissance. For me fall is the season of cool, dark evenings full of festivities and food. It’s not dead cold yet and it feels good to get out of the heat. Customers live in these things. The march of the homeowners is steady and diligent. Some use riding mowers to vacuum up leaves. Other homeowners use services to pick up bags of leaves they’ve collected. As if, smartly dressed ants in a forest. In tiny urban yards a rake seems to work. The greenies like me mulch the leaves in or blow them into wild areas around the yard. All in changing light, cooling temperatures and the wind picking up. It feels good to feel fall. Here’s a list of things you might check around your house this fall. Disconnect all your garden hoses from the spigots. This prevents freeze damage to the frost free spigot. If you’re really energetic pull the hoses out long and downhill to drain. Roll them back up with way less freeze damage in the spring. Make sure all the gutters are clear. Leaves and dirt collect ice. If anything grows over the house the gutters need to be cleaned pretty often. Keep leaves blown off steps, porches, decks, patios and walks. Leaves get slimy and slick when wet. Watch your underground drainage grates and drains for leaf clogs. Money spent on underground drainage can loose it value if they fill with sediment. At the end of fall clean the window wells. Keep them dry and empty during the winter. Having a house often occupies years of time. That’s a lot of seasons. Next time you come home this week. Look at your house. Enjoy the season the house sits in. The colors, the tilt of light changing and leaves settling into their fate on the ground. It’s nice to know the colors we enjoy this year will be a little different next. Something to look forward to.